The top news item driving stock prices was that stock prices were falling. Investors sold stocks because their neighbors were selling stocks. It was a case-in-point week for our view of the market, which is that no news or opinion matters to the management of our portfolios because we make use of price volatility alone. Nobody knows what, if, or how news affects stocks. Explanations around it are narrative fallacy. When there’s no narrative, talk becomes about price change itself, which is all we ever use anyway, and no talk is needed for the running of numbers. We got sell signals across the board again this quarter. As usual, they didn’t come in perfect, this time due to September’s slight drop in stock prices, but we’re still moving a substantial chunk of stock profit into bonds for safekeeping ahead of that elusive crash the bears keep promising. We already had plenty of buying power in our bond funds; now we’ll have more: $754K, or 26% of our overall portfolio with more available as the leverage increases in our plans. We’ll be sitting pretty for a leg or two of downside, should the stopped-clock bears ever get lucky. We stopped $105 short of the $3M mark in our portfolio balance. That’s up 45% from $2,069,352 in Note 50 sent December 18, 2016, the last note published before we converted to the all-Sig system in January 2017, the portfolio plan that has guided us beautifully through media distractions. Leading the charge higher last week was 9Sig, our plan built upon 3x leverage of the Nasdaq 100 index (NDX). The NDX rose 2.3% last week on a 5.6% weekly gain for Amazon (AMZN $2,013 +72% YTD) and a 5.3% for Apple (AAPL $228 +35% YTD). Following the “sell in May” warnings of four months ago, large caps posted their best August performance in four years. The Dow rose 3.0% and the S&P 500 2.1%. The Nasdaq Composite delivered its best August since 2000, up more than 5.7%. We gained 6.5% since our August issue. Both the broad market and our portfolio continue defying the bears. What they’ve been warning about has not mattered, even when fresh warnings were retreads of past pointless warnings, i.e. Greece becoming Turkey, Clinton’s impeachment becoming Trump’s potential impeachment. The bull market the worrywarts missed turned 3,453 days old. That makes it the longest on record, surpassing the one that ran from October 1990 to March 2000, which was also doubted every stair step of the way. Remember that stocks climb a wall of worry. It’s one of few aphorisms that are actually true. Two out of three index flutters went our way, the Nasdaq 100 and the S&P SmallCap 600, such that our portfolio rose 0.4% while the S&P 500 slipped 0.3%, moving us closer to doubling the benchmark’s return year-to-date. This is especially gratifying in light of our sitting on $661K of buying power in safe bond funds. That’s nearly a quarter of our capital. The wind at the stock market’s back this summer is from strong earnings reports and positive economic data. The US economy is remarkably strong, offsetting constant talk of damage from the trade war with China, flattening yield curve, risk of recession, and so on. Business is booming. The recovery erased the prior week’s dip. Two Sunday’s ago, our balance was $2,861,881. It slipped 1.5% to $2,817,683 last Sunday on Facebook’s 17% drop over the prior week due to slowing-growth guidance, but is now back to $2,865,704, a classic if-you-blinked-you-missed-it bout of volatility. The tech-stock decline continued into last week. Headlines at Monday’s close announced the Nasdaq’s largest three-day drop since March. That day, Netflix fell 5.7%, Facebook 2.2%, Amazon 2.1%, and Google 1.8%. Our stock fund in 9Sig fell 4.3%, then rose every day over the remainder of the week for an 8.5% recovery from Monday’s close. For the first time, our 9Sig balance surpassed our 6Sig balance. Considering that 9Sig began in January 2017 at a balance of $471K and closed Friday at $851K, this is remarkable. A simple, automated plan produced an 82% gain in 18 months. That it uses a leveraged fund in a way the financial media tell us cannot possibly work makes it all the more enjoyable. Another bit of joy is that the plan is only 64% invested in stocks with the remaining 36% in safe bonds, another asset media warned investors away from. We ignored their warnings and proceeded rationally instead, and it’s working wonders. Arithmetic over arrhythmia. Our rebalance went off without a hitch on Monday, and we continued outperforming the broader market after moving a portion of recent profits to the safety of bonds. Our year-to-date return rose to 11.9% from 11.6% two weeks ago, and we now stand to benefit from an additional $100K of buying power. Great! It was a consolidation week, with most stocks declining a tad but our preferred small-cap index in 3Sig rising. This helped us fall less than the S&P 500. We remain soundly ahead of the market, and by a margin that grows weekly. We are heading toward a July rebalance that will lock in substantial profits. It’s satisfying to see our system accomplish this with no forecasting. Among top headlines that didn’t mean a thing to our portfolio: President Trump met North Korea’s dictator; the on again, off again trade war between the US and China is currently on again; and the Federal Reserve raised its key interest rate. The market divergence that’s been a hallmark of this year is persisting, and it favors two of our three preferred stock segments. As they say, that ain’t bad. The Nasdaq 100 and small-cap stocks are out in front, while large caps and mid caps pull up the rear. Last week saw our lead over the S&P 500 widen to 5.7 percentage points. Our April purchases look better each week. 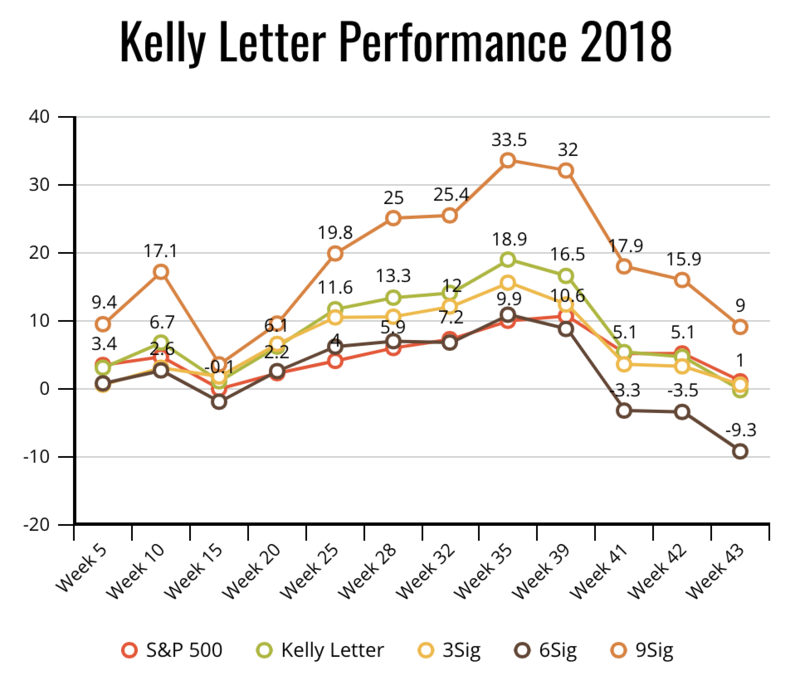 The recent performance hopscotch has favored our portfolio, first providing strength in our preferred small-cap stocks two weeks ago, then in our preferred tech stocks last week. While the broader market has barely budged, we’ve moved briskly ahead to widen our outperformance to 4.5 percentage points over the S&P 500 so far this year. Great! It’s been a long time since our preferred small-cap segment of the market bolstered our returns, but it did so last week. As large caps and technology took a breather, the S&P SmallCap 600 stepped up and posted a sizable 1.6% gain. The Russell 2000 index of small-cap stocks posted three record-high closes from Wednesday through Friday. This small-cap strength kept us flat for the week while the broader market retreated slightly. It appears investors have become more bullish on small-cap stocks lately due to their higher domestic revenue exposure. This spares them the emotional ups and downs of rising bond yields, trade tensions, the strong US dollar, and other global matters. You’d never guess from the bang-up performance above that three weeks ago the news was dominated by hand-wringing over the possibility of slowing iPhone sales in coming months. This concern sent shares of Apple (AAPL $189 +11.4% YTD) down more than 6% to $166 in a descent that began on Wednesday of that week. The market apparently came around to our way of thinking, which is that the change of emphasis from hardware sales to services on top of the enormous installed base makes sense. Shares of Apple recovered 13.9% in the past three weeks, helping 9Sig’s preferred Nasdaq 100 to rise 4.3% and [the 9Sig stock fund] to surge 12.7%. It was a tale of two weeks in one, with the S&P 500 opening higher on Monday and continuing upward to the halfway point on Wednesday, then descending at about the same speed over the second half of the week to end barely above where it started. We came out ahead of the S&P 500 last week, but would have come out farther ahead if not for a Friday swan dive by the Nasdaq 100, down 1.6% that day with our [9Sig stock fund] down 4.8%. The catalyst looks to have been analyst warnings that iPhone sales might slow in coming months. This sent shares of Apple (AAPL $166 -2.1% YTD) down 4.1% on Friday and more than 6% in the descent that began on Wednesday. It’s the largest Nasdaq 100 component by weight, at 11.6% of the index. Our quarterly rebalance happened at a good time, guiding us to buy ahead of a rebound. The buying of tech weakness ahead of tech strength in 9Sig was particularly gratifying, as both moves were bigger than the S&P 500’s. Tech fell more sharply than the broader market, then spiked more sharply, in the middle of which we bought more leveraged exposure. Thanks to this, our 9Sig plan rose 5.3% last week, and with $65K more riding the tech rebound than rode the tech fall. By comparison, Facebook (FB $165 -6.8% YTD) rebounded just 4.7% last week. Hard as it is to remember during pleasant rebounds, we would do better in the longer run with another quarter or two of declining prices to draw in more of our capital. For now, it’s good to see a price rise shortly after we committed more to stocks. Our quarterly orders filled on Monday, putting more of our safe bond capital to work in the current stock market weakness. It’s unfortunate that last week’s drop couldn’t have happened a week earlier, but that’s how the ball bounces. We wanted buy signals across the board this quarter, and we got them. They didn’t come in perfect, due to last week’s rise in stock prices, but we’re still moving a substantial new chunk of capital into stocks at prices lower than the ones we sold at in January. It was the biggest weekly price decline since January 2016. We’re getting exactly what we wanted this quarter, and on our preferred schedule. The buy signals in all three Sig plans are substantial this weekend: $53K in 3Sig, $89K in 6Sig, and $73K in 9Sig. Their three stock funds are below their quarterly target prices by the following respective percentages: 5.5%, 15.5%, and 17.0%. For people with buying power, like us, this is great news. Our preferred smaller-company indexes are holding up better than their large-cap peers in the focus on US trade policy. Tariffs, withdrawal from multilateral agreements, and the resulting higher price of imported goods make business harder for large American multinationals. Smaller companies tend to be domestically centered and therefore less sensitive to changes in trade policy. Our rebound from a recent balance low of $2,434,604 in Note 6 sent February 11 has taken us 10.6% higher, nearly back to our recent balance high of $2,735,894 in Note 4 sent January 28. Another 1.6% tick up will do it. We are ahead of the market, which is good, but continue wishing that prices would decline one of these quarters to generate a big buy signal to pull in capital from our bond funds. We may get our healthy buy signal this quarter yet, which is what we’ve been wanting. A week ago, it looked like the correction was going to disappear in the rearview mirror, but last week’s action kept some of its benefit tantalizingly still-at-hand for us. February’s price decline ended a 10-month rising streak for the Dow and S&P 500, while the Nasdaq moved lower for the first time in eight months. It’s inappropriate to refer to rising prices as “winning” and declining ones as “losing,” because both are part of a profitable process. The metaphor I like is respiration. Neither inhaling nor exhaling is preferable, but part of the necessary package. Just as we don’t think of inhaling as winning and exhaling as losing, nor should we assign those labels to price movement. Hence, February showed a decline, that’s all, and one we hope persists another month. The rebound continued at a much more modest pace than in the previous week, when the S&P 500 rose 4.3% and our portfolio rose 6%. The Nasdaq 100 remains the leader, having risen 5.6% in the previous week and 1.9% last week, the best of our six tracked indexes in each week. Our fund in 9Sig rose 18.2% in the previous week and 5.6% last week. The recent correction is looking like a blip, and a v-shaped one at that. From 2873 on January 26, the S&P 500 fell 10.2% to 2581 on February 8, then rebounded 6.4% to its current 2747. Another 4.6% gain by the big index will make it seem as if nothing happened. The week provided us with a nearly complete rebound from the previous week’s decline. We rose 6.0% last week after declining 6.3% the week before. Contrary to the standard media method of cheering price rises and booing declines, we are hoping for a lower-price quarter. Quarterly fluctuation is more profitable than going too far in either direction. Of course, what anybody wants is irrelevant. We’re staring at a half-full glass this weekend. The half-full way to view it is that our portfolio came roaring back from a price dip right away, which is consistent with what financial media say should make us happy. The half-empty way to view it is that we were wanting and still want a serious buy signal this quarter, but last week’s snap-back more than halved our shortfall. The string of 5% losses across the indexes represents the biggest one-week downdraft for stock prices since early 2016. As usual, explanations are narrative fallacy. The truth is probably this simple: the market went 15 months and 34% higher without so much as a sniffle, and was due for a correction. So the correction everybody knew was coming someday, just not when, came. That’s all, but it triggered an outpouring of pent-up frustrations bigger than usual because it had been longer than usual in coming and smoother than usual in the run-up. It’s not true that we haven’t seen anything like last week in recent times. Just two years ago, exactly, in February 2016, the market fell 15% on worries that China’s economy was slowing and heading for a hard landing. It wasn’t, and stocks got back to rising. We never have cause for concern in our Sig systems, which it’s worth repeating are built for the express purpose of exploiting volatility. They take surpluses off the table for safekeeping, as they just did at the beginning of January. They redeploy them into shortfalls, as we hope they’re able to do at the beginning of April. We’re sitting on $725,150 of bond balance. Our shortfalls this weekend would draw in just $255,558 of it. We could use another round of bargainizing. The market reversal moved all three of our Sig plans back into shortfall territory for the quarter. A week ago, they sat on a collective surplus of $34,264. Today, they’re at a shortfall of $94,886. This is what we wanted, a price decline, as mentioned over the last few months. After another round of selling at the beginning of January, we maintain buying power of $669,774. That’s after last week’s 1% drop in bond prices. Ideally, we would be moving the last of it in near the bottom of whatever stock-market slide is underway, although this would only be possible if it were to coincide with our pre-determined trading dates. Luckily, close enough is good enough in our system. Isn’t it nice not needing to care what happens next? Our Signal system continues performing well. Last week saw all three permutations make it into the surplus zone for the quarter, just four weeks in. The star of the lineup is 9Sig, which has performed so powerfully since its debut a year ago that it’s almost ready to overtake 6Sig in size, as the summaries below make plain. Just last week saw 9Sig’s balance increase by $35,639. Its balance is now only $38,047 shy of 6Sig’s balance, so we could well reach the mid-point of this quarter with a 9Sig balance larger than our 6Sig balance. This is astonishing. Just three weeks into the new year, 9Sig is once again outshining its less aggressive senior partners in 3Sig and 6Sig. It uses 3x leverage, therefore by definition it will have an edge in a rising market, and all one ever reads about anymore is the relentlessly rising market, hence the shining spotlight on 9Sig. And, oh, what a light! At the three-week mark, and just two weeks after its quarterly rebalance that robbed it of $98K of exposure to the Nasdaq 100 at 3x, it’s only 0.8% below its balance target for this quarter. So far this year, 9Sig is up 12%. The S&P 500 is off to its strongest start to a year since 2003. Despite our selling into strength last week and currently holding 28% of our capital in bonds, we’re staying ahead of the big index. However, it’s getting harder for us to do so. Counterintuitive though it may be, we need a correction or a crash one of these quarters to achieve greater benefit from our price reactive system. An always-rising market is the hardest kind for us to beat, and this one’s been on fire for quite some time. In 2017, we grew our balance from $2,057,509 to $2,523,385 with a quarter of our capital in safe bonds. Simplicity and rational reaction won again. Over time, they always do. November 26 Comment: Stocks rebounded from their two-week decline last week, and are now back at all-time highs as investors revisit their annual excitement about holiday sales and historical winter market trends. Extra strength in technology and small caps powered our portfolio farther ahead of the S&P 500 for the year. … We are pulling nicely ahead of the market, and it’s no longer just 9Sig in Tier 3 doing all the work. October 8 Comment: We’re back above the S&P 500 for the year. If this year’s fourth quarter goes anything like last year’s, we’ll put a lot more daylight between the benchmark and ourselves by the end of December. Doing so with a quarter of our capital safely in bonds would be impressive. October 1 Comment: Just a week ago, Tier 1 sat 0.4% below its target for the quarter. Then, out of nowhere, it shot 3.2% higher, grabbing all of its quarterly goal in the final week. … I wrote last Sunday that “[Our growth fund] in Tier 1 has roared back 7.3% to $71.95 from $67.08 on Aug. 21, leaving us with just a $3,230 shortfall for the quarter.” The stats have improved since then. [The fund] is now up 10.6% since Aug. 21. … The resurgence in Tier 1 has helped us reach two impressive milestones this weekend: (1) A balance of more than $1 million in Tier 1 alone ($1,026,505 to be exact), and, (2) A portfolio return now dead even with the S&P 500, both at 14.2% year-to-date. July 21 Comment: We pulled almost even with the S&P 500’s YTD return last week. All upward momentum is still from the Nasdaq 100 in Tier 3. June 30 Comment: Even though both Tiers 1 and 2 fell short of their quarterly goals, our portfolio rose $68,088 (3.2%) in the second quarter. We’re less than two percentage points behind the total return of the S&P 500 this year. We’re up 7.4% to its 9.3%, putting us in the running to beat the benchmark in 2017, and are well ahead of it over the past three quarters due to the powerful small- and mid-cap showing in Q4, which is partly what caused this healthy backing and filling in Q1 and Q2.